We specialize in renting cars for low prices, if you're looking to save money then you've come to the right place. Our used cars are very cheap and we also have a selection of New cars, so it really depends on how much you'd like to spend. All of our cars are in great condition. We offer free pick up and drop off service depending on distance. We serve all airports such as Burbank/Bob Hope Airport and LAX Airport/Los Angeles Airport. If you don't have insurance, we also sell insurance at a low cost. We have plenty of specials if you're looking to rent long term. If you have any questions about any of our services, Please don't hesitate to give one of our locations a call. We strive to make your car rental experience a great one. 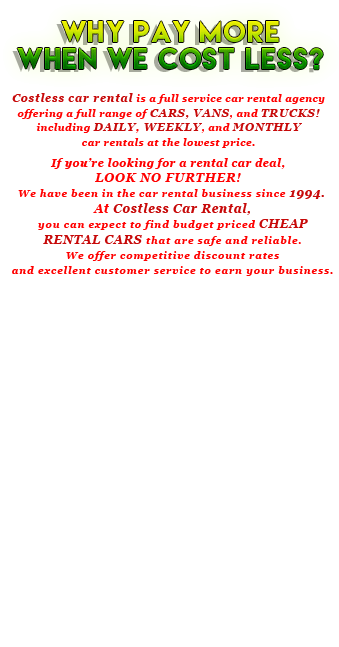 Copyright © 2019 Costless Car Rental. All rights reserved.